It's been a long time, but it's finally here. Google's big answer to the iPad—the tablet that created an entire market—has officially arrived. And it's bringing a better-than-retina screen, curves and serious speed. Its name is Nexus 10, and it's $100 cheaper than the iPad. Learn all about it here. 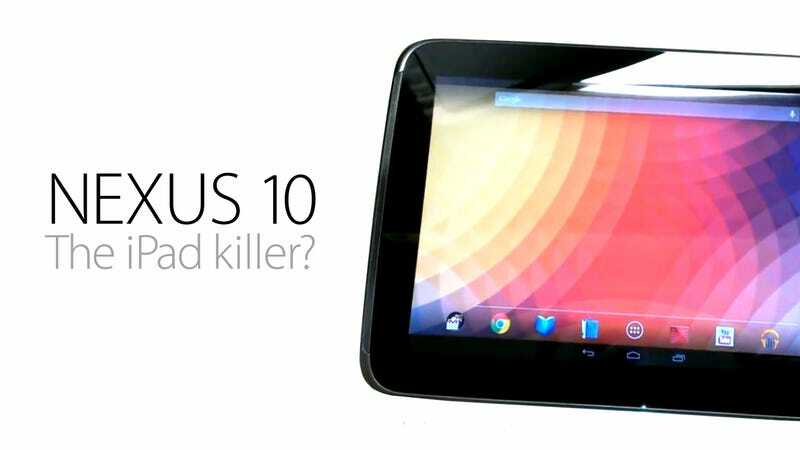 Looking at the specs, it seems that the Nexus 10 can be a more than worthy big tablet contender. The screen is sharper than the iPad, running at a whooping 300 pixels per inch. It's a tablet that has the potential to change the marketplace, just like the Nexus phone started the trend that eventually forced an iPhone design change. It has 2GB of RAM, which is is more than you'll find in most comparable tablets. There are 16 and 32GB models. The screen is a 10-inch 2560x1600 better-than-retina display. That's extremely sharp for a tablet of this size, over 4 million pixels. It surpasses the iPad, which only has 264 pixels per inch. The Nexus 10 is 300 pixels per inch. It's also better than its closest competitor, the 8.9-inch Kindle Fire HD. On the front it gets better than Apple's tablet: 1.9 megapixels. Google claims that the battery gives you nine hours of video playback. That's not as good as Apple's advertised battery life: up to 10 hours. But battery life is notoriously hard to pin down based on what companies say; we'll have to wait until we try it out ourselves. You can learn more about all of Android 4.2 features here. The price is perhaps the most surprising aspect: $400 for the 16GB, $500 for the 32GB model. That's $100 cheaper than the iPad. Amazing when you consider how much better the specs are, and continuing the trend—which had all but disappeared these last few years—of Apple being outgunned on the price tag. It will be available on November 11, in the Google Play Store in U.S., U.K., Australia, France, Germany, Spain, Canada and Japan.